Make your vacation to the Smokies an AMAZING JOURNEY this year and plan your getaway in this incredible 5 bedroom Pigeon Forge log cabin! Conveniently located in Alpine Mountain Village - the log cabin resort is just one mile from the center of the action, shopping, and entertainment in Pigeon Forge. Dollywood, The Cal Ripken Experience, The Island and more are just down the street. The resort itself includes walking trails, two outdoor pools and a picnic pavilion for guests' use. Enter from level parking across the covered porch and into the spacious, vaulted, main living area. Stone fireplaces, LED TV's, and a custom kitchen with dining area are all open concept. 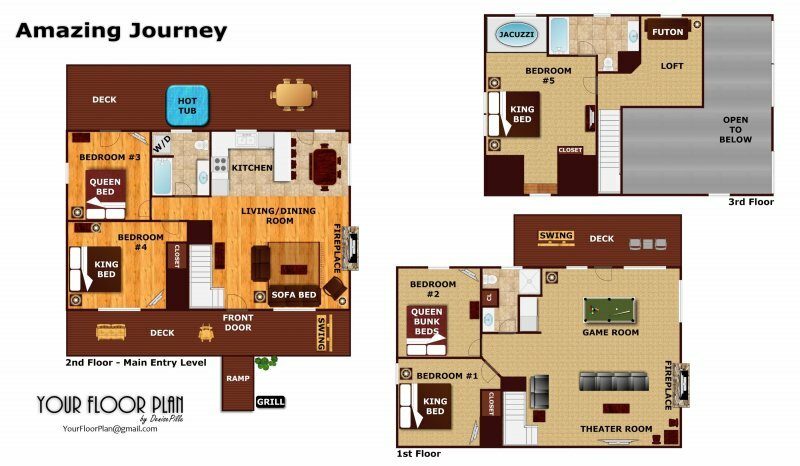 Downstairs a large game room with pool table also includes a theater area with reclining theater style seating! Comfortably decorated bedrooms, log beds, and LED TV's add some mountain luxuries. When you journey to the Smokies this year make your stay Amazing! Call today. The cabin was exactly what we needed to accommodate our group and was located close to our events and attractions we wanted to visit. Had a great weekend making memories thanks to you! It was an enjoyable stay. Love the location of the resort only minutes away from everyting. Can't wait to come back again. Absolutely loved the cabin! Very comfortable and clean! Not to mention beautiful! We will be back! Cabin- amazing journey- great cabin!